Physical Description: Tall and muscular. Average features. Jude Devereux was born on October 12th, 2359. He has no knowledge of his real family, as he was giving up for adoption. He was a solemn and reserved child, and had no love for his adoptive parents. 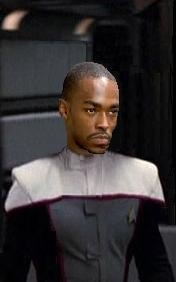 At the age of 18, he left home and joined Starfleet. He is the no nonsense type and has been since childhood. He’s also a perfectionist and workaholic. He hones his flying skills any time he has a free moment. In fact, his work is his hobby. He enjoys flying and wants to be the best in his profession. He never settles for second best. He is extremely competitive and looks down on people that doesn’t meet their potential. He refuses to drink alcohol because he believes it will inhibit his ability to pilot. 2378: Receives commendation for outstanding flying. 2382: Transferred to SB Trinity Core as a wing leader of Trinity Flight. Hobbies: Flying and enjoys poker. Personal Traits: Perfectionist, workaholic, stern, and authoritative. Jude doesn’t have many friends because he isn’t very approachable. He keeps to himself and doesn’t make an effort to socialize. He would rather practice his flight skills in the holodeck than go drinking with “comrades”. However, he does enjoy a good game of poker and has an exceptional poker face.